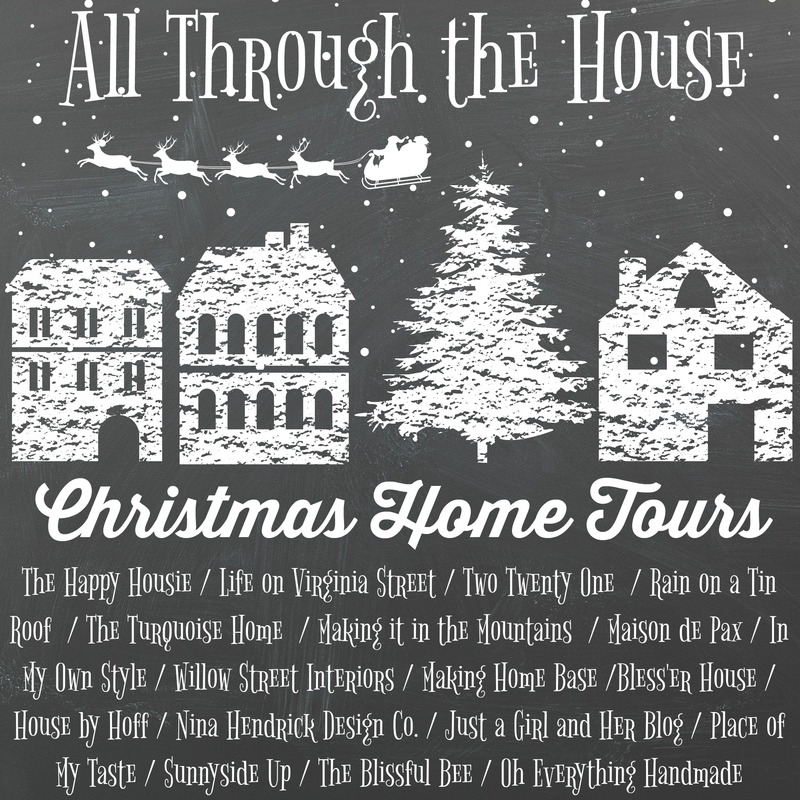 Today I’m joining up with some of my blogging friends where we are all sharing a part of our holiday home for the All Through the House Tour. I am sharing Christmas decorating ideas in my living room, including how I decorated my Christmas tree with handmade and nostalgic ornaments. In the past few years I have decorated my house for Christmas using the colors turquoise, pink, purple and lime. I love these colors, but when we moved to the lake and wooded lot, these colors just didn’t seem right, so this Christmas I am using traditional red and green. I decorate my house for Christmas to not only look festive, but more importantly to exude happiness so that everyone who comes to visit feels that warm and toasty Christmasy feeling. One of the reasons I previously used non-traditional Christmas colors was the fact that one of the main pieces of furniture in my living room was turquoise. I still have it, see a sliver of it above on the right? A few weeks ago when I was at Michaels, I found extra wide plaid ribbon with red, black and turquoise! I had never thought about putting the colors red and turquoise together. I loved it, bought 2 rolls and my color scheme for Christmas was set. 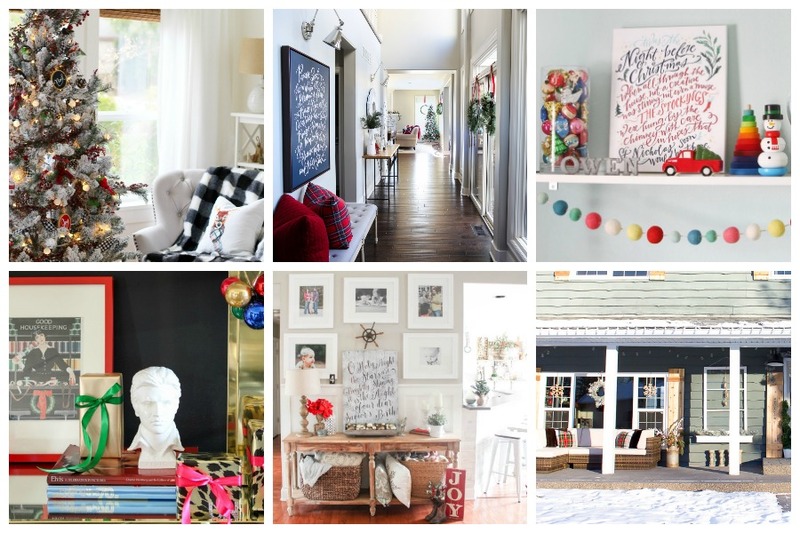 Having white walls and a pretty neutral color scheme in the room, makes holiday colors pop. We always buy a fresh tree. This year it is a Fraser fir. The ornaments on it are mostly handmade by my mom or myself, but we do have plenty of purchased ones also. I made the SIS ornament above. It was a playing piece from a vintage board game. Th red velvet heart I made after my dad passed away. I posted about it, here. I made it from a shirt he wore every Christmas day. I made one for my siblings and daughters so that my dad’s signature shirt comes to life every Christmas. I DIYed this stone fireplace myself. It used to be a brick wall. In my previous house we had a big screen TV above the mantel. This is the first time in years that I got to decorate a mantel again. I enjoyed decorating it with a snow theme. You can read more about it, here. I shopped my house and the Christmas bins that I kept after purging so much when we moved. I had the stool in the attic and used a few of the garlands I had for past trees… The snowball one is my favorite. The pom-pom garland is from HomeGoods. The small white pom poms are yarn that I used a few years ago to hang paper snowflakes I made in windows. It is no longer sold, which makes me happy that I kept it. I fashioned the topper using foam snowflakes. I have a few dozen of these that used to hang on the tree in previous years. It is tradition in my family to always use a vintage gold topper, but this year’s tree trunk was way to thick and the topper would not go over it. I had to come up with something and found the snowflakes in my stash. Every year, even as a child growing up, furniture had to be moved to make space for the Christmas tree. I found a new spot for the rocker that got displaced. I kinda like it here. Since is swivels, it can be turned to face the kitchen or the living room. I kept the decor pretty simple, greenery from my yard with some ornaments and candles, and of course a little glitter. I even tucked some in the open shelves in my kitchen. I made the fabric covers on the poinsettia pots. I am not a fan of the foil they come with. Here is the link on how to do it: Flower Pot Cover. Pretty and simple… :-) More time to sit back and relax so I can enjoy the season, although I am still working on the kitchen makeover. I am 3/4’s of the way done. I will post an update early next week. To display Christmas cards we receive, I made this framed ribbon board. You may see a ribbon from a previous project I posted about. I used up the leftovers. It is hanging on the side of the cabinets in my kitchen. I have a tutorial ready and will post it in a few days. …along with the candle glow. It creates the perfect peaceful atmosphere. …and the gazebo and dock for Christmas. What colors do you decorate with at Christmas? This week I’m joining up with some of my blogging friends where we are all sharing a part of our holiday home for the All Through the House Tour. 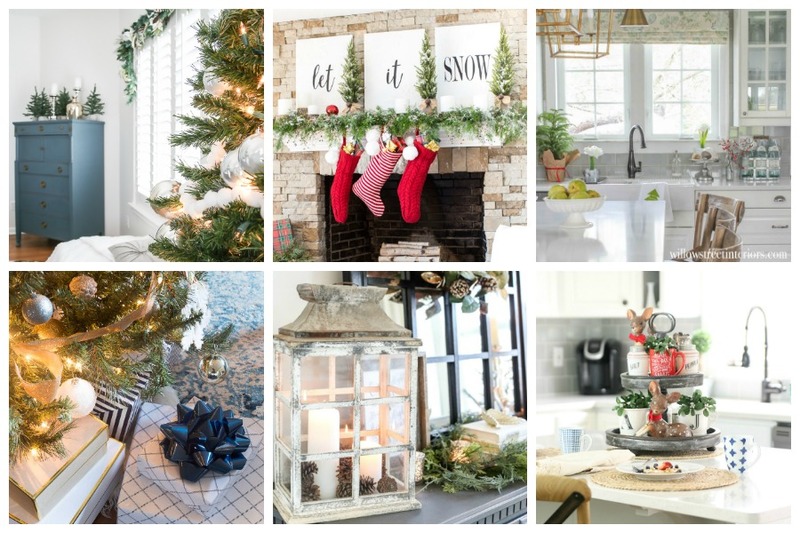 Christmas Decorating Ideas house tour. It is absolutely beautiful. You have a gift for decorating for the Holidays!!!! Keep up the incredible job!!! You have the perfect amount of plaid in your house! I absolutely love it. It makes me realize that I have no plaid in mine. Boo hoo! I guess I’ll just have to stare at your home tour more often! Absolutely stunning! Love all the colors, your Christmas tree is so puffy and unique, and the dock decor WOW! Your stone DIY fireplace is AMAZING! Love your red plaid throughout the house. Everything is gorgeous! I love that you used the traditional Christmas colors. I too live on a lake and I can’t imagine using any other colors. The plaids are also my favorite. I have enjoyed following your journey as you make the house your own. Your house is gorgeous, Diane! I loved the tour! That fireplace stonework is amazing– kudos to you! Hope you’re having a wonderful week! Did you make the ‘Let it snow’ prints yourself? Or are they on canvas? Love it! Diane, I have always loved your blog!! You love colors and the most adorable things, like me! I love, love, LOVE this tree!! And all the darling things around it….the plaid blanket, the display of gifts (gave me a few ideas! ), your FIREPLACE!! I so want to rock ours….it has large, porcelain tiles that aren’t exactly my style. One day maybe we will replace them. Anyway, I live about 1-1/2 hours from you in the Spartanburg area. I would love to come and tour your home :) I am sure many people would and you would show great hospitality. Keep doing what you’re doing….inspiring all of us. Thanks, and have a wonderful, MERRY Christmas!! Hi Diane…simply stunning…love everything you have done, and especially incorporating those you love and have lost into your Christmas…you are a girl after my own heart…sappy and nostalgic but in such an elegant way! I too, love to sit in our living room with only the treelights on, and spend quiet time with a glass of wine or cup of tea, and think of days gone by….this post felt like you gave us all a hug!!! Thankyou. Did you just the metal ring that you used in 2012. I could not tell looking in you pictures? I noticed it was plaid but couldn’t tell. We do not have live trees due to allergies but, the ring I love it makes our fake tree look real at first glance. Hi Lou – I didn’t use the ring, but I still have it to use again someday since it does make decorating the tree easy. I wove each garland horizontally around the tree. Diane, your mantel is just the best thing ever! I love it! Your home looks SO cozy and inviting for Christmas! Everything looks so festive! Love your blog! Your decor and your photography is STUNNING, Diane! I cannot believe you DIYed that fireplace yourself. It’s amazing! Diane, I love all the bright red you used this Christmas!! I have to say, I love your fireplace and mantel the most though! The “Let it Snow” prints are perfect! Hi Jenna Thanks. I haven’t been able to decorate a mantel for years because we had a big screen TV above the mantel in my previous house. I really enjoy finally being able to decorate one. Hi Diane–Just love your Christmasy look! I’ve been a fan of yours for a long time, but I’m always serendipitous surprised by all the great things you teach and show your readers. Thank you for all the hard work you put into your blog and posts–it is most appreciated. Diane! What a cheerful, christmassy space you’ve created. It’s so warm and welcoming. I’m loving all of the plaids that you used, and that dock! Seriously swooning! You are my DIY hero LOL.. Your home looks so cozy and welcoming. I love all the handmade ornaments : ) especially the one made from your Dad’s Christmas shirt. What a great keepsake for your family. My Mom passed 19 years ago and I miss her dearly. I have a few ornaments that she gave me and I treasure them. You have given me a great idea to make an ornament out of her favorite dress that I have. I know my siblings would love to receive one too. Have a wonderful day and thanks for all the festive inspiration! Everything done with such class and good taste. Can’t wait for the kitchen update…I am starting mine after Christmas!!! It’s absolutely beautiful Diane!! I love all the traditional colours this year – I went that route as well and, you are right, it feels so natural with the outdoorsy location of being by a lake. Your big fraser fir is gorgeous, and decorating the dock walkway?! So fun! We can’t access ours now with the winter water being so high! Thanks Krista – The trad colors do look so much better and blend in with what I see out the windows. :-) Send us some of your excess lake water. We have been getting rain…so needed. I am hoping the level rises back to normal soon. So cute!! Looking forward to the card holder tutorial! Just think…a year ago how much you have done. You certainly will have a great reflective New Years Eve. Could you share where that pretty plaid blanket is from? I have enjoyed following your move! My husband & I moved to Charleston, SC a few months after your move. We purged, downsized, & simplified as well. Nothing like living on the water!? Everything looks very festive :) I’m starting to decorate today! Hi Carol SIS – :-) I can make you one. I have all the ones from the board game. I think it was called, Go to the Head of the Class? Love all your Christmas displays! Did you buy your poinsettias with those cute green wrappers or do that yourself. I really don’t care for the foil ones they come in. Hi Lucinda – I did make the fabric covers for the poinsettias and will be posting about how to do it tomorrow. Good Morning Diane!! Your home looks so beautiful, cozy and so welcoming! I too have used the red and green color scheme this year. This is our first Christmas in our new home, so it took awhile for me to figure out how to decorate! Well I’m loving it and so happy to be finished!! Our tree is fresh, which we have always had, with 2000 lights! I too love to see the ornaments we have had for so long and there’s always a story to go wth each one! Even the Naval Academy one!! Love seeing all of your beautiful pictures of your Lakehouse! Enjoy the joy and peace of this Christmas season! MERRY CHRISTMAS TO YOU AND ED! Go Navy Beat Army! ??? Hi Sharon – Thank you so much and thanks for reading. XO I hope you have a very Merry Christmas an enjoy the season.